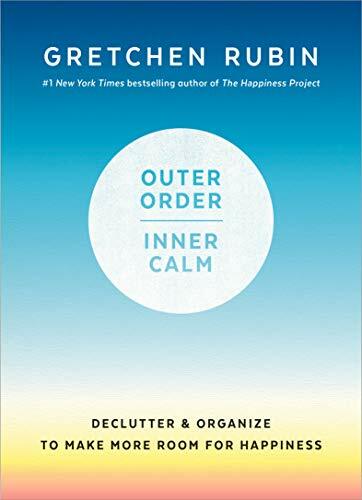 GRETCHEN RUBIN: When you're trying to clear clutter and create outer order, a really helpful question to consider is are you an overbuyer or an underbuyer. And maybe you're neither. Maybe you're just a middle buyer. But many people are overbuyers or, like me, they're underbuyers. So overbuyers are people who just love to buy. They shop. They do errands. They make lists. If they're going to travel, they've got 10 things they need to buy. If their kids are going back to school, they've got 15 supplies that they need. They often will rack up, like, big stockpiles of slow-moving things, like toothpaste or soup. They'll do things like buy something that's going to make a wonderful gift. They don't know who they're going to give it to exactly, but it seems like a wonderful gift. Or they buy things in multiple colors, or they buy a lot of things on sale. And being an overbuyer means that, often, you have a lot of errands and tasks that you feel like you need to do. You can run out of space because you've got all this stuff that you need to store and manage. You can lose track of how much you have of something because you keep buying a hammer. You don't realize that you have five hammers. And you can spend a lot of money on things that you don't really need yet. And you can even run into the problem of waste, where something like a scented candle kind of goes bad even before you use it or you're able to give it away, or some kind of medicine expires before you even get to the point of using that bottle of medicine. So if you're an overbuyer, you want to say to yourself, hang on, do I really need to buy this thing? Maybe I can store it at the store. I will leave that extra bottle of toothpaste at the store, and I can get it when I need it, because I'm going to store it at the store, and I'm going to hold myself back. Now, there are also underbuyers. Underbuyers are people like me. We don't like to shop. We don't like to spend. And we will often go to kind of extraordinary and silly lengths to avoid it. Underbuyers typically don't like to buy specialized products. For instance, for a long time, I didn't have a raincoat. Why do you need a coat specifically for rain? I didn't buy Kleenex. I can just blow my nose in toilet paper. Why do I need a special tissue paper to blow my nose? I don't believe in conditioner. I don't use shaving cream. There's a lot of things where I just don't want to buy something. Now, being an underbuyer is good in some ways, because you save yourself a lot of money and you don't run that many errands. But it can also be really inconvenient because underbuyers often don't have things until the very last minute, and then it can be difficult to get them. Like, if you wait till the very last minute to buy mittens, the store often doesn't have mittens anymore. They've moved on. Often, underbuyers are making do with things that are kind of shabby or aren't really suitable for their purpose. Like, maybe it would be nice to use shaving cream to shave instead of using soap, or whatever my makeshift solution would be. And underbuyers often, too, are very inconvenienced, because they are running out of toothpaste, they are running out of saline solution. There's things where, you know, it doesn't hurt to have a couple spare rolls of toilet paper somewhere in your house or apartment so that you're not always doing everything just in time. And so that's one thing underbuyers need to remember, is to encourage themselves to buy, to look for opportunities where spending and buying could make their lives easier and more convenient. And here's the other thing about clutter and underbuyers. You might think to yourself, well, underbuyers won't have clutter because they don't like to buy and spend. No. Often, underbuyers have just as much clutter as overbuyers, because underbuyers hate the idea of having to go out and buy something. And the idea like, oh, I haven't worn this black jacket in six years, can I get rid of it? And I think, well, gosh, but imagine that a situation arose where I needed a black jacket. The idea that I would have to go out and buy a black jacket is awful to me. I hate that idea. So I'd better hang on to everything, because I can imagine a scenario where just about anything in my life could come in handy. Because I don't want to risk that I might one day want to make bread with a bread maker, I want to hang onto that bread maker, even though I haven't used it in five years.